An incredible art installation at Benesse House, Japan. In a world where hotels are attempting to emulate the art gallery experience, Alison Langley found a Japanese art gallery totally nailing the five-star hotel experience. 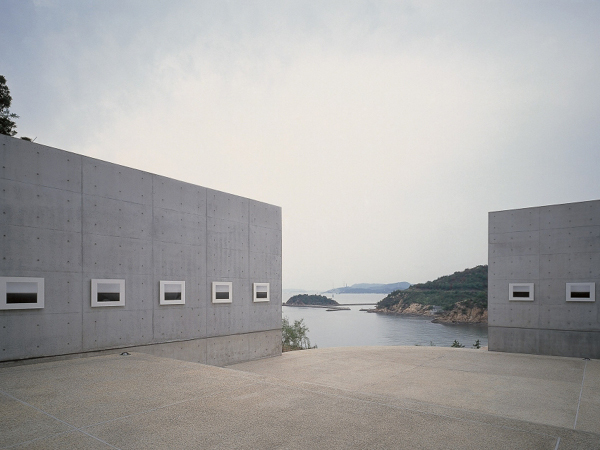 As we board our polka dot-covered ferry to Naoshima, an art island town based in Japan’s Seto Inland Sea, my partner and I get the sense that we’re about to embark on something pretty special. 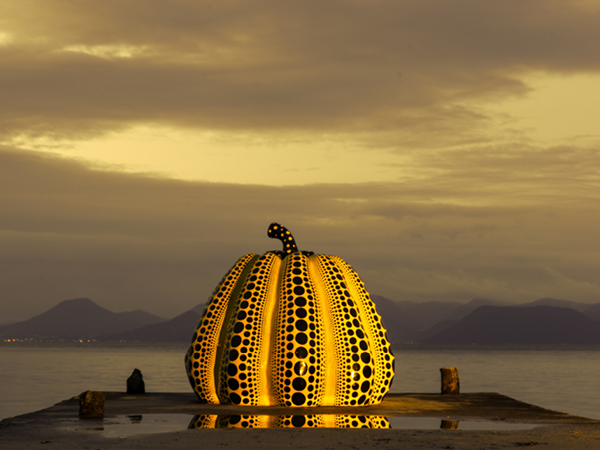 Arriving on the island at Miyanoura Port around twilight, we’re instantly greeted by the most beautiful spotted red pumpkin, a piece by famed artist Yayoi Kusama. We’re drawn to the giant vegetable and feel the urge to act like kids again, to weave in and out of its holey exterior and take silly in-the-moment pictures of the experience. Deterred by the on rush of other tourists, instead we jump straight on the 15-minute shuttle ride to our hotel, Benesse House. Outside, it’s easy lose yourself while meandering through the museum/ hotel grounds. 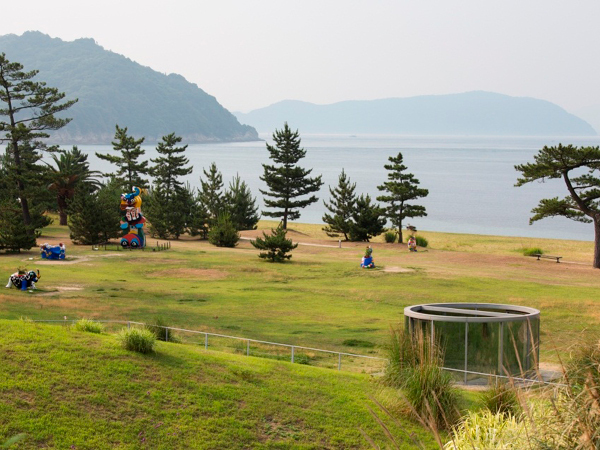 Green grassy parks and the iconic dreamy haze of the inland sea makes a perfect backdrop to a number of outdoor artworks by the likes of Yayoi Kusama, Niki de Saint Phalle, Walter De Maria. Pro tip: artworks are best viewed at golden hour. The rooms are light and breezy with a palette of crisp whites, dark browns and blonde timbers staying true to the minimalist intent. The chosen artwork framed in the room? A piece by legendary light artist James Turrell, no biggie. Everything in the room has its place, with clever nooks and crannies designed to ensure the flow of space isn’t disrupted. At the time of check-in, the restaurant is already fully booked for dinner so in the evening we walk for 20-minutes and find a small, no-fuss eatery called Raumen Tsumu. A bowl of ramen, a side of karaage chicken and an Asahi is around $20. Everything is delicious, and we resolve to go back (and do). The next day, we are ready for full day of art consumption and catch an early breakfast at the Terrace Restaurant (AUD32.00 per person). Our table is positioned to give us a beautiful view of the misty blue waters beyond the shore. The breakfast buffet is best described as safe. 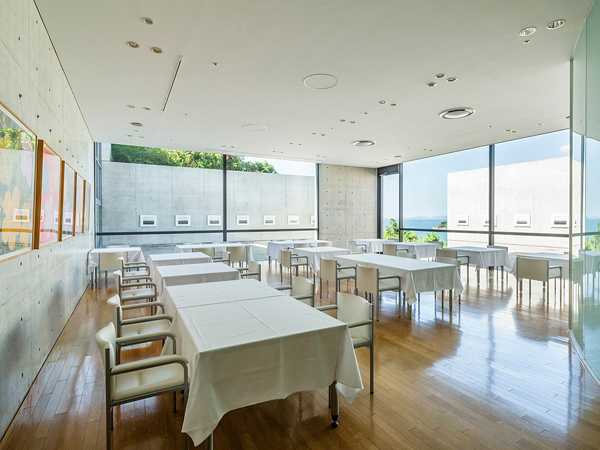 It features both Western and traditional Japanese selections that wouldn’t look out of place at a large hotel chain catering to corporate business guests. The food was tasty but not amazing, and not what I expected from a hotel of this calibre. It does do the job though and provides enough fuel for the amazing day you have ahead of you. After we finish our breakfast and before we start our full exploration of the island, we decide to wander around the grounds again to make sure we have covered all corners of this expansive art site. The daylight provides a completely different feeling to the evening before, the artworks are bright and bold, the landscape is vibrant and serene. It leaves you asking the question, does it get better than this? The only thing left for us to do is hire a bike and find out! 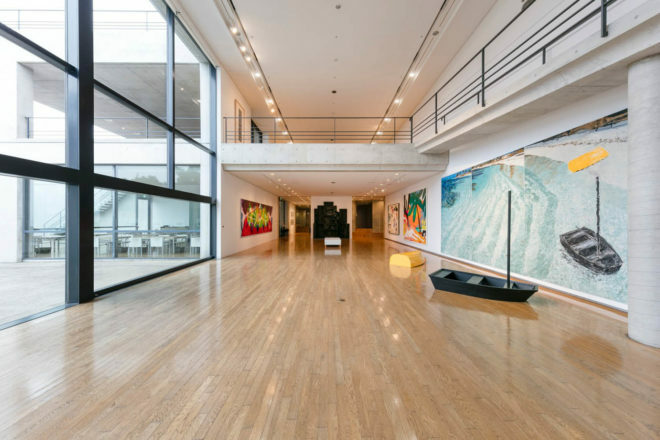 Benesse House is a breathtaking one-of-a-kind property that contrasts sleek, minimalist architecture with vivid and emotional artistic expression. Designed as an extension of the pre-existing art site, unless you bought your joggers it isn’t the most convenient location to use as your base camp. Take advantage of the free island shuttle bus or hire electric bicycles. Staff were attentive and couldn’t wait to fill us in on any information we needed about the site, the island or anything else. 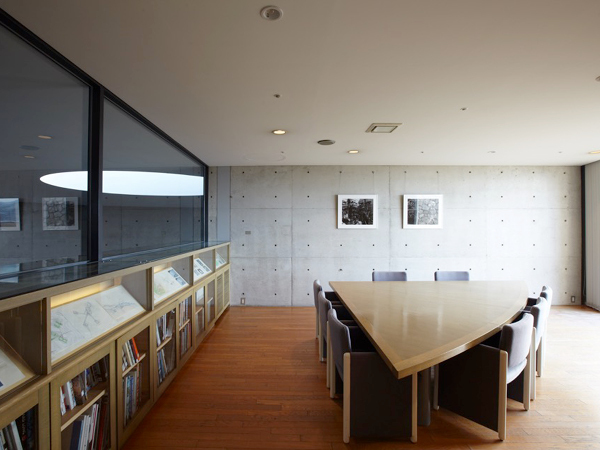 The hotel is an architectural feast for the eyes, so the rooms act as a respite. The colour palette of the rooms is soft with blonde timber and our room featured a piece by James Turrell. We only ate breakfast at the buffet, with both Western and traditional Japanese offerings. They were tasty but we were more blown away with the view than the food. Park Double with a balcony came to 32,076 yen per night (approximately $390) and was worth every single penny.